Let's all give it up for blouses! There are very few styles which have dated, in fact I'd go as far as to say the majority are timeless. It's more the way in which a blouse is executed which makes it feel current or trend lead, such as the colour, the fabric, the shape or the pattern. For example take any blouse in a thin blue and white stripe (I'm not a fan of the term "Pin Stripe", apologies), add in a few frills and team it with a sharp pair of culottes and you're definitely winning this season. Basically what I'm getting at is when I write about a certain style it's not necessarily that I think it's "in", more that it's my flavour of the week! 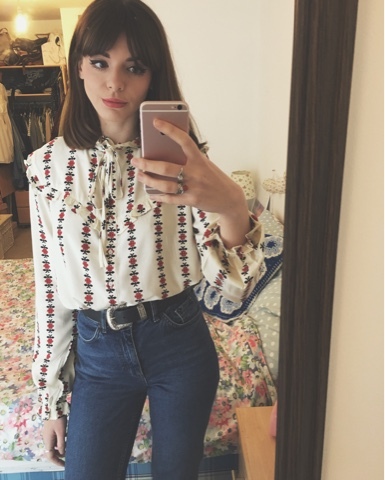 My particular favourite at the moment is the Prairie blouse. The Pie Crust- Frill detailing on shirts, jumpers and tees is having a bit of a renaissance at the minute and I couldn't be more frilled about it (pun 100% intended). Any respectable Prairie blouse isn't afraid of using excessive amounts of frills also known as a Pie Crust hem (the title aptly fits with the Americana Deep South Prairie theme which makes me happy no end) on the neck, cuffs and down the front. Frillin' hell! Bows, Ribbons and Ties- Who needs a button fastening when a neat little bow does the job just as nicely? I'll tell you who doesn't, the Prairie! Ties on the neck and cuffs are a must on this blouse and as well as making it look extra pretty it gathers in that pie crust collar to make it well... More frilly to be honest. 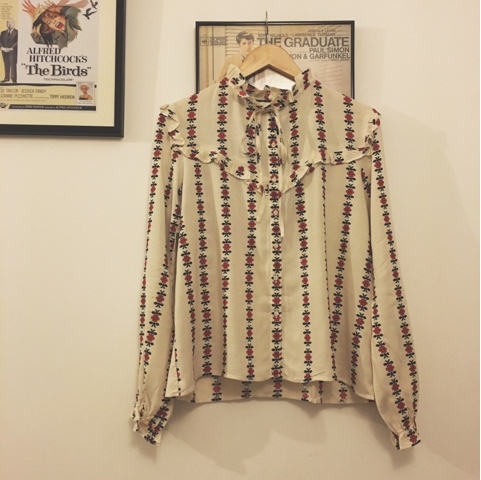 The Pattern- Where the Victorian blouse comes in more muted, feminine colours and delicate embroidery often in a similar colour to the fabric, the prairie is loud and proud. It can be in just about any colour, pattern or material. Gingham and florals are never to be shied away from and why not throw some lace in there too! The Collar and The Bib- As mentioned somewhere above, the Prairie is less uptight than the Victorian blouse and so the collar is less rigid and high. In fact a simple ruffle where the collar should be will suffice. And naturally any bib featured should always be lined in a matching ruffle too, because did I mention the prairie blouse likes a frill? Above are the two I particularly fell in love with and have already worn to death. The black and red floral striped pattern on the Motel blouse makes me swoon and it's not too loud that you're limited to what it will go with (I've worn it to death already. It goes with E V E R Y T H I N G). 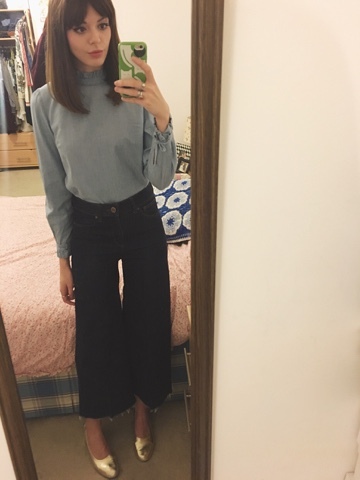 The Zara denim blouse, is a modern take on the Prairie shirt and I'm not going to lie, any denim variation on pretty much any item of clothing wins it for me (this strictly excludes accessories, wear a denim hat or a denim shoe and I'm sorry but we can't be friends. It just wouldn't work. It's not me, it's you... And your hat). 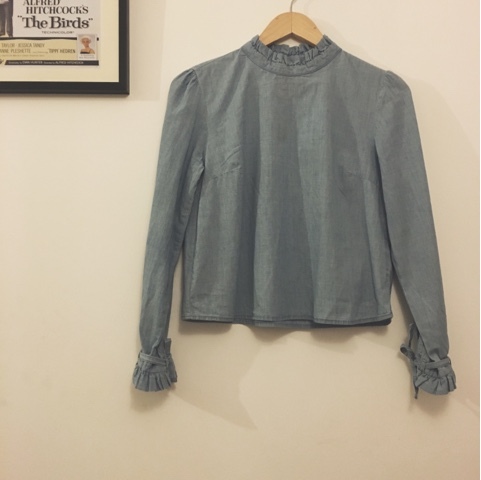 This blouse is to be worn as a double denim duo with jeans or to sit nicely with a suede A-line mini/midi or as seen on me below, teamed with a seventies style cropped flare. Oh the possibilities are endless. 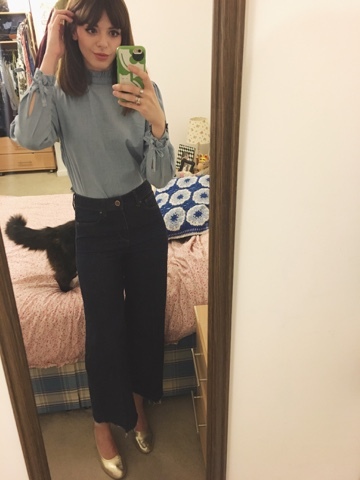 And there you have it the defining- yet not so crucial- but extremely appealing characteristics of the prairie blouse, along with a little style guidance from myself (featuring Evie the cat) to hopefully help y'all put together a rootin' tootin' darn good outfit. Yeeehaaa! I make no secret of the fact I'm a HUGE Orla Kiely fan, her designs are always ridiculously in tune with my style. She nails my taste and everything I adore about clothes in one fell swoop within every collection she creates. So imagine my utter delight when I discovered the video presentation for her new AW16 Orla La collection sat waiting patiently for me in my inbox this afternoon! The video is an absolute dream. Created by film maker Mercedes Helnwein featuring Northern soul inspired music from Chris Watson along with some very care free, whimsical, Northern Soul-esque dancing from the models (which immediately wins extra brownie points from me). The collection is a wonderful mix of sixties effortless glamour with quintessential British style. Baby doll dresses in day-dream pastels teamed with earthy toned petticoat jackets. Bold mustard's next to shimmering metallic's. Plush velvet, upon tweed tailoring with velvet ribbon trims. Frilled knitwear and pretty Organza ruffles... I've literally died and gone to clothes heaven. My wish list from this collection is endless (and by endless I mean I basically want EVERYTHING). Plus the majority of outfit's featured are then nicely finished off with my all time favourite Orla Kiely gold Mary-Jane's I pretty much never have off my feet! It's all too much! It would have been seriously rude of me to not share this video with you. So aren't I a good friend? Orla Kiely AW2016 from Bankhouse Productions on Vimeo. When I first started writing my blog I was always a little self conscious of my content and a little over aware that it consistently needed to be interesting and readable and "me". Nothing phony or contrived. 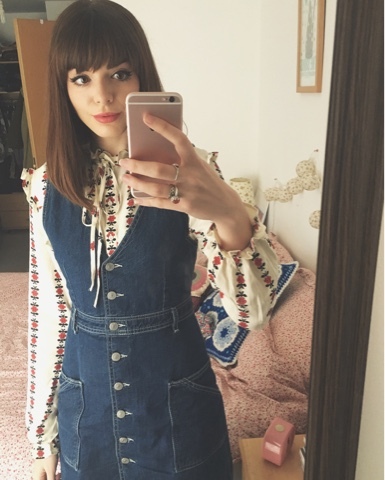 I was super paranoid about writing the same old rubbish and it all sounding a little stale, "floral's for spring, seventies are in..." Continue the rest yourself because you've probably read it a million times. I've tried to always follow a theme or a story and ensure I had something with a bit of depth in what I wrote, mainly so all you lovely people who actually read this don't fall asleep mid post because it's as dull as the idea of "floral's for spring". But in all honestly all I want to do sometimes is show you what I credit as a lovely outfit and say "do you like this, because I love it". Sometimes they aren't the most ground breaking outfits, but then I don't deem my style to be. I can't repeat it enough I'm a lazy dresser! 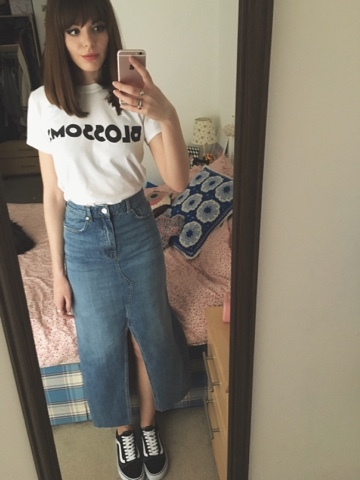 My first principle in choosing an outfit is always, is it easy? 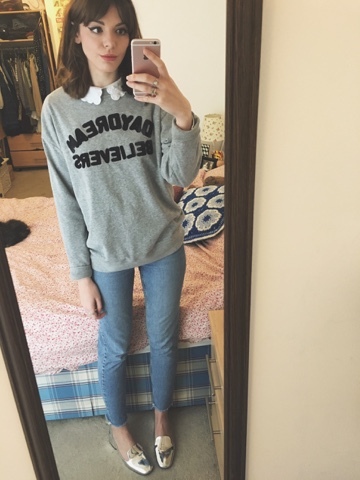 So with all of the above in mind this post is simply about my two favourite (possibly quite standard, depending on your taste) outfits that I've particularly loved wearing in the past two weeks . And I hope that's ok with you and I hope you like them.